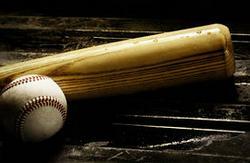 From the very beginning, the game of baseball was played with wood bats. Specifically, they were made of ash. Baseball bats in those days were very heavy and sported big thick handles. In the 1850’s most players made their own bats. There were no restrictions on size or shape in those days. In fact, some players actually used a bat with a flat surface when they were bunting. Restrictions on bat shapes and sizes first appeared in 1859 when a rule was made that the diameter of bat barrels could not exceed 2.5 “. This was followed in 1869 with a rule that restricted the length of a bat to 42” (the same maximum length allowed today). The next time bat dimensions were addressed by the baseball rules committee was in the 1890’s. The end of a bat must now be rounded rather than flat, and the barrel size was increased to 2.75” in diameter. The basic shape of wood bats has not changed very much at all since those early days. The biggest difference in the wood bats being used today is the size and weight. Babe Ruth was reported to swing a bat that weighed 46 ounces. A few years back Mo Vaughn swung a 36-36 and Alfonso Soriano used a 35-35. Today most Pros swing a bat with a thin handle that is 34” long and weighs 32ozs. In my opinion, the biggest change in the game of baseball started way back in 1924 when William Shroyer was issued a patent for the first metal bat. It wasn’t until 1970 that the first metal bats appeared in a game. They were intended as an economical and ironically, safer alternative to wood. The thought process was they would not break as easily as wood thereby reducing the cost of replacing broken bats, as well as eliminating the possibility of a player or fan being injured by a piece of flying lumber. Not a bad thought at the time, however we all know the sequence of events that followed. Bat manufacturers tapped heavily into modern materials and manufacturing processes to produce ever more powerful and dangerous metal bats. The game was changed forever as routine fly balls turned into home runs and balls hit two inches up the handle became bloop singles. More importantly, pitchers and third basemen became human targets for baseballs traveling more than 100 mph. As metal bats became more powerful year by year, injuries rose dramatically until things finally came to a head in 1999. The NCAA decided to stop the madness and began testing aluminum bats. Specifically, testing the speed a baseball exited metal bats under very strictly controlled conditions. Their goal was to develop a performance standard in metal bats that mirrored that of the best northern white ash wood bats. This standard became known as the BESR which stood for Ball Exit Speed Ratio. They determined that metal bats could not exceed 2 5/8” in barrel diameter, must be no more than -3 in length to weight ratio, and must meet the BESR standard for ball exit speed. The result was a bat that was less lethal than its predecessors. The National Federation of State High School Association adopted these standards for all high school participants in 2001. A few years later the metal bats were once again tuned down. This time they were labeled BBCOR “Batted Ball Coefficient of Restitution.” The result was an aluminum bat that generated just a bit more ball exit speed than a wood bat. Just about the time high school teams made the switch to the BESR standard, wood bats began to make a comeback. Most people attribute the surge in wood bat popularity to the introduction of hard maple as a viable alternative to ash. Barry Bonds was the first big name player to make the switch, and the rest is history. Soon Major Leaguer’s were jumping on the maple bandwagon spawning a huge increase in the number of bat manufacturers producing maple bats. Small companies like my own (Pro Bats) sprung up across the country. Modern technology was applied to the manufacturing process of wood bats making it possible to produce an extremely high quality product. For the first time, we were able to put the exact bat used by the big-name Pros into the hands of amateur players at an affordable price. This was not the case with ash bats. The best quality went to the Major-League players with the rest filtering down through the Minor Leagues. The bats we purchased at the local sporting goods stores were not very good at all. They broke easily, and you never knew how much they weighed.